1. In a bowl, mix yogurt, red chilli powder, turmeric powder, cumin powder, coriander powder and salt. 2. Add the mutton pieces and mix well. 3. Keep aside to marinate for an hour. 5. Add bay leaf, cloves and cardamoms. 6. Stir-fry for 15 to 30 seconds. 7. Add chopped onions and fry until golden brown. 8. Add the ginger and garlic along with the marinated mutton pieces. 9. 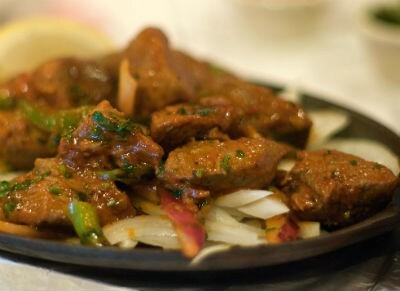 Stir well for 10 minutes or until the mutton is cooked and tender. 10. Add the tomatoes and green chillies. 11. Keep stirring from time to time and add 1/3 cup of water. 12. Cook till it starts to boil and add garam masala powder and salt. 13. Cook for a minute longer. 14. Garnish with coriander leaves, ginger pieces and green chillies. 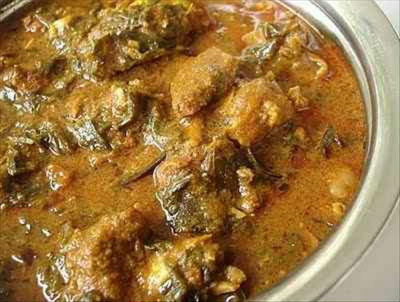 Feel free to comment or share your thoughts on this Dhabe Da Meat Recipe from Awesome Cuisine.